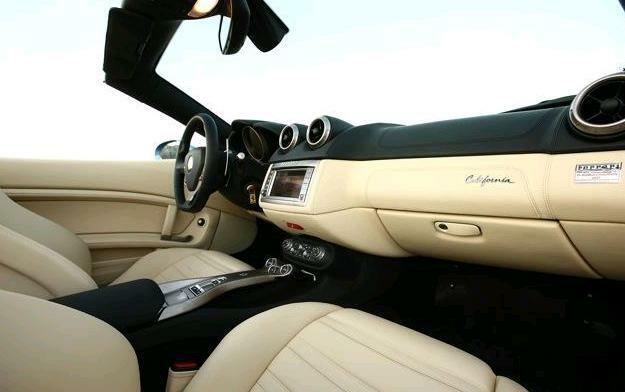 Ferrari California comes with a newly designed aluminium body, cabriolet coupe with metal top that opens and closes in 14 – 16 seconds. The Ferrari’s first dual clutch, also the first Ferrari model of direct gasoline injection and the V8 engine. The ambition of Ferrari comes alive if one gets into the ‘California’. In a car industry like recession, the drop of sales is extremely negligible to Ferrari manufacturer. It is easily understood considering the niche market and models favored by the celebrities. However, California is not merely a concept to make its appearance. The prohibitive pricing could be out of reach but the taste of the ride is targeted at German sports model. The ultimate goal is to always in the forerun. If there is an option of 3,000 US cash to spare, a Delphi developed of magneride suspension would be installed which is based on magnets rhcological fluid technology with its varying damping capability to enable excellent smooth ride ever. Also the Porsche PDK allows smooth gear change with both manual gearshift and automatic mode, the low speed faster acceleration experienced in the garage during reverse from stop to start in milliseconds unlike automatic gear, with its logic switch press forwards to shift up and pull backwards to shift down. In addition, it has the trunk structure to accommodate two golf bags. Moreover, at super high speed, a non disturbance of conversation plus won’t let your hair in disarray or hair set into disorder if the opening of the window reflector is activated so a long touring cruising will not be bothersome at all either. In the same way, eagerness for the sporty F430 and the like is very much sought after to ride on and the stroke of the suspension allows even greater roll to scrape through at every cornering. Ferrari still stands out if compares with a general GT car. It is very racy and the exhaust howling sound and pick up especially for F430 direct injection is more fantastic though starts at low 500rpm. In addition, the launch control where the steps on the brake and the accelerator at the same time once release would leave it dashes forward in no time. The highly acclaimed performance of ‘F458 Italy’ which is a joint development with Getrag comes with high quality seven gear dual clutch system is waiting to be seen. This entry was posted on Sunday, December 27th, 2009 at 10:11 pm	and is filed under Interesting Stuff. You can leave a response, or trackback from your own site.